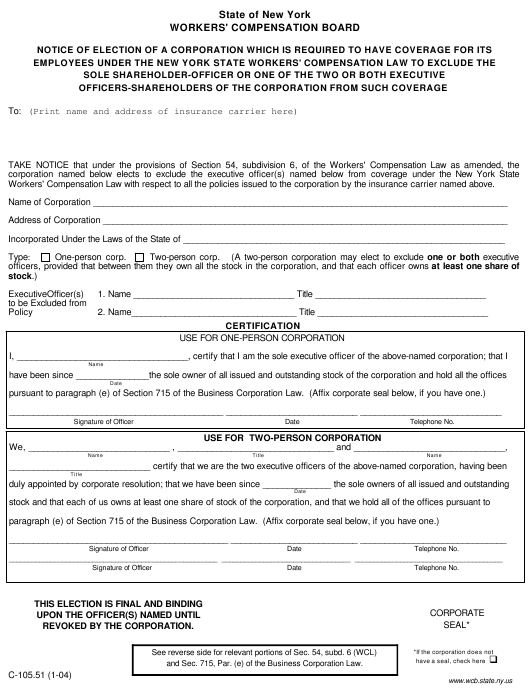 Form c-105.51 or the "Notice Of Election Of A Corporation Which Is Required To Have Coverage For Its Employees" is a form issued by the New York State Department of Labor. Download a fillable PDF version of the Form c-105.51 down below or find it on the New York State Department of Labor Forms website. Workers' Compensation Law with respect to all the policies issued to the corporation by the insurance carrier named above. and Sec. 715, Par. (e) of the Business Corporation Law. the notice until revoked by the corporation in accordance with paragraph a of this subdivision. carrier. Such revocation shall not be effective until thirty days after such filing. such person may hold all or any combination of offices.